Nov. 18, 2015 — CHOC Children’s has been recognized by Press Ganey, a pioneer in patient experience measurement and performance improvement solutions, for excellence in physician engagement. CHOC Children’s Hospital in Orange received the Pinnacle of Excellence Award and CHOC Children’s at Mission Hospital in Mission Viejo was honored with the Guardian of Excellence Award. “CHOC has worked hard to foster a collaborative environment, encouraging open dialogue and candid feedback. 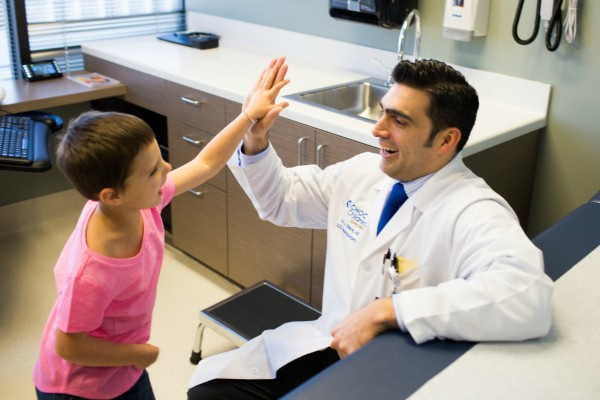 Our physicians are valued partners who share a deep commitment to our mission, vision and values. We all want the very best for the patients and families we serve,” said Matthew Gerlach, executive vice president and chief operating officer, CHOC. The Press Ganey Pinnacle of Excellence Award recognizes top-performing health care organizations nationwide on the basis of extraordinary achievement in physician engagement over multiple years. A nationally recognized symbol of achievement in health care, the Press Ganey Guardian of Excellence Award distinguishes sustained performance in the top five percent of all Press Ganey clients. Press Ganey Holdings (NYSE: PGND) is a leading provider of patient experience measurement, performance analytics and strategic advisory solutions for health care organizations across the continuum of care. Celebrating 30 years of experience, Press Ganey is recognized as a pioneer and thought leader in patient experience measurement and performance improvement solutions. Our mission is to help health care organizations reduce patient suffering and improve clinical quality, safety and the patient experience. As of January 1, 2015, we served more than 22,000 health care facilities.